Patrol police part the parties to the conflict. 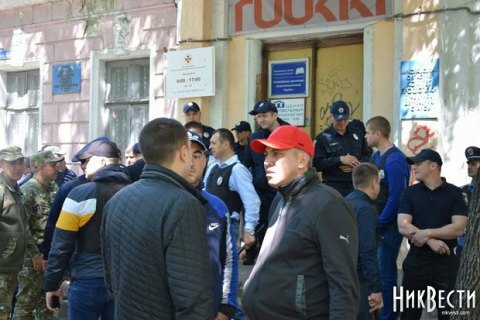 A skirmish between the veterans of the Afghan war and the representatives of the National Corps Azov took place In Mykolaiv. "In a while, Afghans joined the fight with the attackers, which included the activists of Svoboda, Azov and ATO veterans. Patrol police has arrived in the scene and parted the fighters," the report said. According to the nationalists, they found prohibited soviet symbols inside the office of the Afghans, about which they are ready to report to the Security Service. ATO veteran Roman Boyko said that the nationalists "came with a peaceful goal" to find out why the Afghans attacked the ATO members during at yesterday's V-Day rally on the previous day. A representative of the other side denied these accusations and said the fight broke out after the nationalists began to tear the banners of the Afgans. The chairman of the Union of Afghans Yuriy Soloviy was rushed to a hospital at about 13:00 with a bandaged head. Later on, the police gave an official comment saying that two people have been injured in the fight. One of them is in the hospital, the other declined to be hospitalized. A criminal case may be open following an investigation into all the circumstances of the incident. Police has not reported anyone detained so far. The Victory Day marches on 9 May were marred by small-time skirmishes in Mykolaiv, Zaporizhzhya, Kharkiv and Dnipro. Ukraine FM: Macron will continue "Minsk process"